» Wirral Life Award winners! 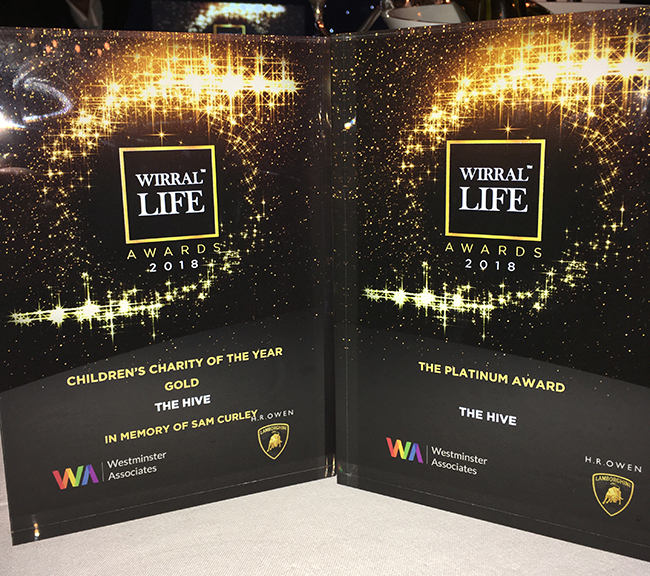 The Hive had a fantastic evening at the Wirral Life Awards, coming home with two awards from the ceremony. Following 400 entries and 127 finalists, the winners were announced at the glittering inaugural Wirral Life Awards 2018 event which took place at the luxury Hillbark Hotel. The youth zone was awarded Gold in ‘Children’s Charity of the year’ and also received the Platinum Award for the best category winner of the night. More than 600 influential people that shape the lifestyle of the Wirral, Liverpool and Chester region attended the ceremony sponsored by Westminster Associates and H.R Owen Lamborghini, to celebrate the inspirational people and businesses in the local area. Headline sponsor, Westminster Associates were delighted to recognise the hard work of those who entered. Categories included: Arts, Business, Charity, Education, Hair & Beauty, Food & Drink, Health & Wellbeing, Leisure & tourism, Legal & Financial, Property & Home, Retail, Pride of Wirral 2018, Lifetime Achievement 2018 and Platinum Award 2018.